Sarah Joyce RMN RGN, who has been the Matron and Registered Provider for 30 years, has been committed to the care of the frail and elderly, and is aware of their vulnerability and the impact of moving to a care home. We maintain numbers of staff to enable them to meet personal care needs, and time to interact with our residents on a one-to-one basis. Our whole ethos is based on maintaining quality of life through choice and supporting independence for our residents, being equally important as the quality of care. Activities are arranged by our Activity Coordinators on a regular basis and we invite families and friends to become involved if they wish to. Following an enquiry we will arrange a visit to ensure that we can meet a potential Resident’s care needs (this may include any equipment currently in use), before a placement is offered; You are encouraged to review your stay with us and your thoughts and feelings will be respected. On admission we will create a personalized care plan to ensure all needs and preferences are clearly documented, enabling our staff to deliver care and support in a consistent and person centred manner. Both our residents and their families are encouraged to become involved in the care planning process. Specialist health care professionals regularly visit Holywell to monitor and review individual Residents . There is a Registered Nurse, with appropriate skills on duty at all times. All our staff attend training programs, which support them to develop their knowledge and skills. 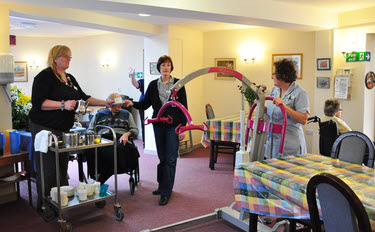 We have 3 activity ladies who provide many different aspects of additional care in group or with individual interaction. This can be from visiting entainment to alternative therapy and visits to local amenities. We also have access to local community transport (like the Slinky Bus). We have a tablet computer and a desktop computer. The Activities staff can help Residents use these for emails, browsing the internet, Facebook, games etc. These can be made available to our Residents who can use these if they have the knowledge. In addition we have wifi which can be used by all. We operate documented safety procedures to ensure the health and safety of all who live, work or visit Holywell.